It is quite easy to feel disconnected from the communities that make our clothes and textiles, but ever since the Rana Plaza disaster, which killed over 1,000 garment workers in Bangladesh in 2013, I have been particularly conscious about where I shop personally. At home, I consider myself to be reasonably green, but working in film creates a new set of sustainability challenges although improvements are being made. For one, in the costume department I work with, we look for ways to source ethical fabrics and strive to reduce our departmental carbon footprint. This process has allowed us to gather information about the social and environmental impacts of textile production, as well as those who are seeking to shake things up for the better. I created the Costume Directory to take the hassle out of finding suppliers who prioritise sustainability, environmental responsibility and fair trade. It is an index of contacts and explains the things to consider when choosing a supplier, brand or factory. 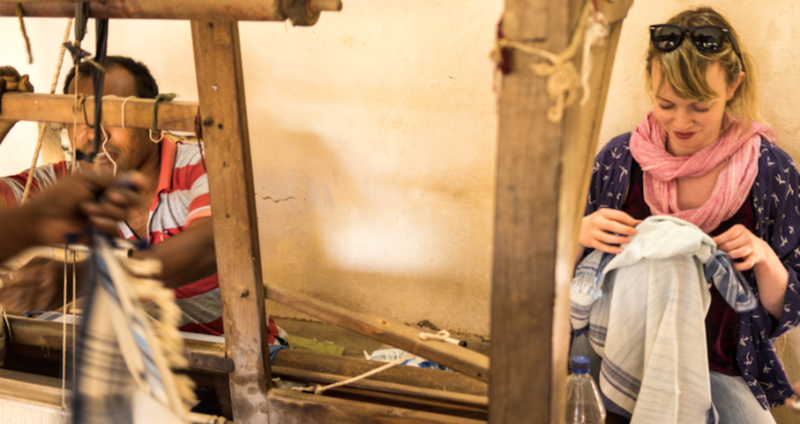 It also provides links to co-operatives, individual artisans and weavers across the world, who are sustaining traditional crafts in local environments. I wanted to create a useful resource to share information and ideas about sustainable material sourcing and procurement with other costume departments – whether in film, television or theatre. I believe there is a willingness among people in our industry to be more socially conscious, however the short-term nature of our contracts, and restrictive deadlines and budgets, mean environmental considerations are rarely a priority. When people consider the terms ethical or organic, the misnomer is that these words are synonymous with expensive and inconvenient. There should be little financial difference in buying organic fabrics over non-organic fabrics, particularly when it comes to cotton; it just depends on the supplier. The directory is not an exhaustive set of rules; ultimately its aim is to get us collectively, as the costume industry, to consciously address the decisions we make, and to see if they could be done in a more ethical and efficient way. Equally, investigating where a particular fabric originated is likely to lead to the discovery of exciting new fabrics, artisans and suppliers. In January this year, I visited some of the co-operatives and suppliers we regularly work with in Northern India, and have seen first hand the difference investing in fair-trade and organic fabrics can make to individuals and their wider communities and environments. The directory hopes to support a fairer, less wasteful industry too. We need a fundamental shift in the infrastructure of the industry so that fabric redistribution, re-use and recycling are an easy and cheap option. I recently assisted designer Jacqueline Durran to create a costume that was ethical and sustainable from head to toe. All the fabrics and threads were either fair-trade or organic, certified or vintage, and the dyes and printing inks were natural or low impact. The whole costume team got involved and the challenge was to produce the costume sustainably, without compromising Jacqueline’s design. It’s not possible to do for every single costume, as there isn’t always the time, but a lot of what we learned we will implement time and time again on future projects – and we’re excited to do so. By its nature costume isn’t a sustainable sector, as it ultimately produces one off items with a limited purpose. Organic? Recycled? Fairtrade? Local? There are also minefields of contradictions when deciding which element of ‘ethical’ you are trying to address. For example you might find the perfect fair-trade organic hand crafted cotton, but it’s in India and you need it in a hurry so the only solution is to air freight it thousands of miles. However, as with anything, even small collective efforts contribute towards a wider culture and attitude change. There is a saying “No one can do everything, but everyone can do something”. Whilst it is the priority for any costume team to realise the look of a particular character and support the visual look of a film, costume designers can make simple choices that will contribute to a growing movement for change.